So this past weekend, we checked another thing off of our Summer Bucket List. Riding horses on a trail! 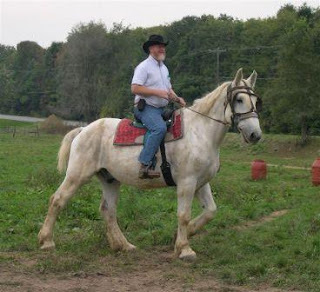 I have taken horseback riding lessons on and off over the years. I took them when I was 6 for a year or so, then again when I was 11 or 12, then again at 16, and then at 19. I really want to get back into it but it's time consuming and expensive. One thing I was never able to do was go on a trail ride and my boyfriend has never been on a horse in his life so this was the perfect oppurtunity for us. 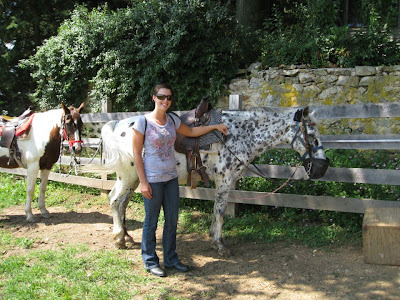 We found a stable in Lancaster called Allimax Farm and they offer 1 and 2 hour trail rides. We arrived there around 1:30 and got a tour of the stable where they introduced all the horses. There were horses and ponies of all different shapes and sizes. The cool thing was that each one has a personality that is so unique. Then it was time to watch a safety video, and finally we got to go out to the ring to get our assigned horse. There were 4 horses. One was this huge white Percheron named Bert. He was enormous but the best behaved and they said he is great with beginners. ﻿ The next one was Oreo. He apparently is testy with certain other horses and he kicks if you get to close behind him on your horse so they normally have him in front of Bert because Bert is so tall that it doesn't matter if he gets kicked at. Then there was Harley, which is the horse Johnny got. Harley was beautiful and great for riding. Of course Harley and Oreo don't get along, Duh! Well as we all get on our horses the other people on the ride with us decided to ride behind each other which left Johnny and his horse behind me and Oreo. Of course!! It was okay though because I controlled Oreo just fine. The trail ride was about an hour along. We went through a corn field or two, over a little bridge, up some steeper rocks and hills, and along streams. It was beautiful and the horses were so well behaved. The whole drive home Johnny kept talking about how much fun he had and how much he missed Harley and we both decided we want to try trail riding at other stables in the area! Can't wait for our next one. It was a great experience! And if you live in PA, I highly recommend checking it out at Allimax Farm! looks like a blast! My step daughter just got married on June 16 and they just returned from a "mini moon" they went to a dude ranch in Michigan. She is a talented rider and she loved it!